Figs are an old world fruit that grow on trees suited to Mediterranean climates. Figs belong to the genus Ficus, a common group of houseplants. Figs that produce fruit need bright light and protection from cold. Although many varieties of fig become huge trees, some types are suitable for container growing. Good potted fig tree care must include knowledge on how to prune fig trees in containers. The home gardener may wonder, “When can I prune my container fig tree?” Read on for tips on pruning fig trees. Figs for small spaces or areas with hard winters thrive in containers where they can be moved indoors for winter. Choose a fig variety that is suitable for your zone and with the degree of hardiness necessary to thrive where you live. If you want fruit, you will also need to choose a plant that can self-pollinate. Provide well-drained soil, a large container and even moisture. Fertilize in spring to promote the new flush of growth and formation of fruit. 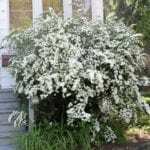 The plant needs little pruning except when young to help create a strong frame. Learn how to prune fig trees in containers to accent the shape and formation of fruit on potted fig trees. When Can I Prune My Container Fig Tree? The best time for pruning fig trees is after fruit has ripened, usually in mid-summer. This allows time to harden off the fresh growth that is stimulated by cutting. Young trees respond well to light pruning that creates an even scaffold of strong branches. Fruit is born on the previous season’s growth, so avoid removing those terminal branches. Start any pruning project with clean sharp tools. A hand held bypass pruner is probably all you will need. 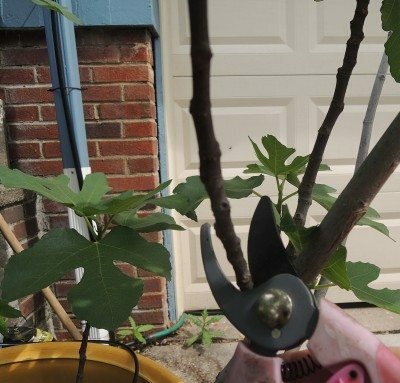 On young potted fig trees, remove any suckers that come up from the rootstock and trim off excess branches to leave 3 to 4 strong peripheral branches. Choose one straight stem for a central leader. Pruning fig trees that are mature only requires removal of dead and broken stems. Be careful not to cut into the parent wood and leave a clean cut that will seal quickly. Bonsai is an ancient form of container gardening that relies upon root and stem pruning to create an aesthetic form and diminutive size. There are specific rules on how to prune a bonsai fig tree. 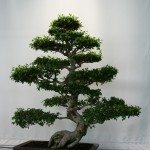 The plants are delicate and should be trimmed by a knowledgeable bonsai master or studied gardener. Special bonsai pruning kits will have all the unique tools necessary for pruning a bonsai fig. If the process is done right, the result is a handsome contorted, tiny tree. Methods on how to prune a bonsai fig tree can be found at your extension office or from bonsai experts.